Minister Lam noted that over his 45-year revolutionary career, Tran Dai Quang was entrusted with many important positions by the Communist Party of Vietnam, the State, the Ministry of Public Security (MoPS), and the people. The positions included Secretary of the Central Public Security Party Committee; Minister of Public Security; head of the Steering Committee for the Central Highlands region; member of the Party Central Committee for the 10th, 11th and 12th tenures; member of the Politburo of the Party Central Committee in the 11th and 12th tenures; President of the Socialist Republic of Vietnam; Chairman of the National Defence and Security Council; Commander-in-chief of the people’s armed forces; head of the Central Steering Committee for Judicial Reform; and National Assembly deputy in the 13th and 14th terms. With over 43 years serving in the public security force, including more than 20 years holding important leading and commanding positions, Tran Dai Quang has always set a bright example of loyalty to the Party, the Fatherland, and the people, as well as of the resolute combating spirit and the utmost effort for the noble goals and revolutionary ideal of the Party and for the people’s peace and happiness. He directed the entire public security force to carry out in-depth, synchronous and comprehensive reform of all aspects of their work and perfect principles, measures, and tactics to fight all types of crime and criminals. The force has kept sharp lookout for sabotage plots and activities of hostile and reactionary organisations, factors that can undermine domestic stability and criminal activities, while foreseeing possible complicated situations in order to be proactive in every circumstance. The public security force has succeeded in defeating all “peaceful evolution” and overthrowing schemes and activities of hostile and reactionary forces wanting to eradicate the Party’s leadership and the socialist regime in Vietnam. The public security sector has designed and implemented effectively plan to ensure absolute safety for important political events, major holidays and international events held in Vietnam; international delegations on visits to Vietnam; activities of Vietnamese Party and State leaders in and outside the country; and key political, economic, cultural and social works. Lam added that during his many positions, Quang has directed drastic measures to fight all kinds of crime, especially organised, transnational, drug-related, high-tech, and environmental crimes. He also promoted the public security sector’s coordination with procuracies and courts in investigating, prosecuting, and judging major economic and corruption cases and recovering stolen assets, which has been highly valued by the Party and State, as well as winning over the support of the public. Imbued with ideologies and viewpoints of Marxism-Leninism, the Party, and the late President Ho Chi Minh on the great role of the people, Tran Dai Quang paid special attention to communication and education activities to get people from all social stratas to actively engage in preventing and combating crime and law violations. He also considered the people as the source of strength and the “All people defend the Fatherland’s security” movement as the basic condition for people to exercise the right to mastery in the safeguarding of security and order. Tran Dai Quang and the Central Public Security Party Committee and the MoPS also took the initiative in expanding the public security sector’s external relations and cooperation with the security, police, and interior forces of other countries and enhancing the ministry’s participation in regional and global security cooperation mechanisms. 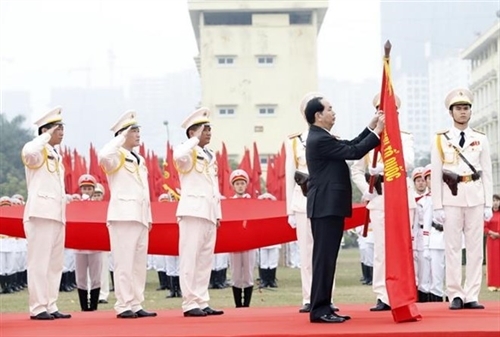 As a result, the MoPS now has an important voice in the settlement of international issues regarding crime fighting, thereby helping to improve the standing of the Vietnamese public security force; ensure national security, social order, and safety; and develop Vietnam’s friendship and partnership with countries around the world. Minister Lam said that while holding many important posts, Tran Dai Quang still reserved time and efforts for studying and developing theories on the people’s public security force. He has authored hundreds of scientific studies, textbooks, articles, lectures, which, along with his viewpoints, directions, and strategic decisions about security and order, has contributed to perfecting the theoretical system for the public security force and the teaching materials in institutes and schools of the people’s public security sector.